Terry Marks is a designer with a quarter century of crafting brands and experiences for companies ranging from Microsoft Stores to DC Comics. Expert at creating powerful and evocative connections ranging from the verbal to the visual, from physical to the digital - and making a memorable connection. Terry is a Fellow of AIGA Seattle and currently serves on the National Board of AIGA, the organization for design and has spoken to dozens of organizations across the US on creativity, diversity, and social impact. 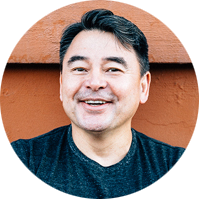 He has deep experience propelling non-profit efforts including the AIGA Seattle LINK Program, Art With Heart, The Experimental Education Unit, The Post Commons, Justice and Soul Foundation, The Refugee Artisan Initiative and more. Awarded SAPPI Ideas That Matter Grants on behalf of ASTAR for Autism and the YES! Foundation, Terry judged the 2018 ITM grants. We live in a world in love with the new. Can taking a broader view by playing the long game supersede fickleness, build loyalty, and create profit over the life of a company? Let’s talk about intangibles, emotional connection, and forging a positive bond between your brand and your customer with packaging.